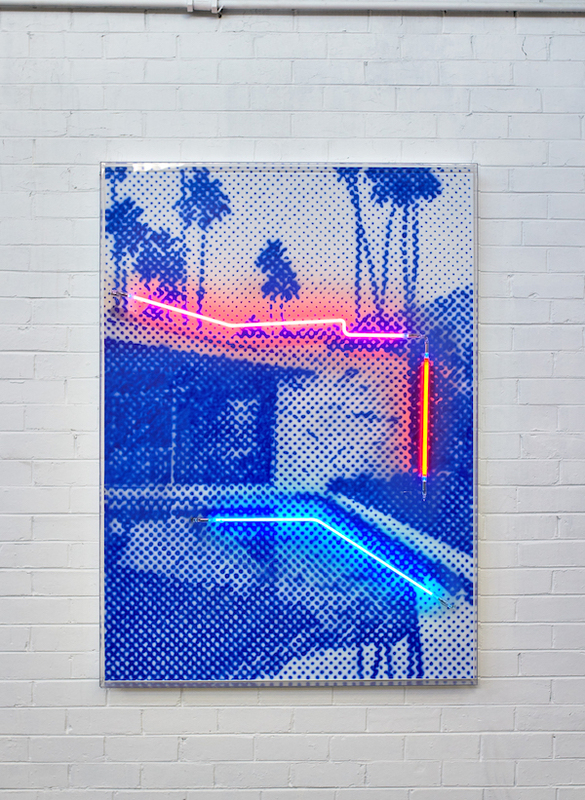 Tom Adair, Private Oasis, 2019, airbrush acrylic polymer and neon on dibond, acrylic frame, 160 x 115cm. Courtesy: the artist and Nanda\Hobbs, Sydney. Tom Adair’s genesis as an artist began in the subculture of the Melbourne graffiti scene. A decade later, he’s replaced the brick and concrete walls of the iconic streets for the studio. “Palm Mirage” investigates the mid twentieth century architecture of Palm Springs, California with Adair’s exquisite hand drawing with an airbrush, accentuated with neon lights.